Witek (DD-848) was laid down on 16 July 1945 at Bath Maine by the Bath Iron Works; launched on 2 February 1946 sponsored by Mrs. Nora Witek the mother of Private 1st Class Witek and commissioned at the Boston Naval Shipyard on 23 April 1946 Comdr. Nels C. Johnson in command. Witek departed Boston on 27 May bound for Cuban waters and reached Guantanamo Bay on 1 June. She conducted shakedown training out of Guantanamo until 2 July when she headed north returning to Boston on 6 July for post-shakedown availability. Fitted out for experimental development work in antisubmarine warfare (ASW) systems Witek received the classification of EDD-848. She arrived at New London Conn. her new home port on 7 December 1946. Over the next 20 years Witek operated primarily off the eastern seaboard of the United States from Narragansett Bay to the Virginia Capes and to Key West Fla. She ranged on occasion into the Caribbean and touched at places such as Nassau Bahamas; Guantanamo Bay and Havana Cuba the Panama Canal Zone St. Croix Virgin Islands Bridgetown Barbados San Juan Puerto Rico Hampton Roads; and Boston On one occasion the ship visited the west coast spending six months in operations out of San Diego testing the sound gear formerly installed in the German heavy cruiser Prinz Eugen in mid-1948. During those tests carried out under the supervision of the Naval Electronics Laboratory Witek's silhouette took on a decidedly different "look" compared to that usually associated with a Gearing-class destroyer. Her second twin 5 inch gun mount (mount 52) was removed at the Boston Naval Shipyard and its place was taken by the "house-trailer full" of former German electronics equipment. That "trailer" was eventually removed at the Norfolk Naval Shipyard in the autumn of 1950. Its place was taken in turn by a trainable Mk. 15 "hedgehog" mount. While at Nassau Bahamas in late October 1954 Witek went to the aid of the local fire department in the British colony when a serious fire threatened the city. Faced with a bad warehouse fire 140 men from Witek rushed into action with 3 000 feet of fire hose walkie-talkie radio sets "smoke-eater" masks four fog applicators and two portable pumps on Sunday 24 October. Working for two hours alongside Nassau police firemen and volunteers Witek's sailors earned a unanimous vote of thanks in "helping stem what might have been the most disastrous fire in the Colony's history." Due to the nature of Witek's work her routine was little publicized and she gained none of the overseas deployment excitement in the course of her more than two decades of experimental work. She made no deployments to the Mediterranean nor any to the western Pacific in addition she never visited European waters. Outside of visiting La Guaira Venezuela the seaport for Caracas in January 1948 Witek spent most of her underway time off the eastern seaboard and in the western Atlantic sometimes in the Caribbean participating in experimental exercises with other units of the Operational Development Force based at New London. She operated primarily with other experimental ships such as Maloy (EDE-791) and submarines testing ASW electronics installations. On some occasions when she conducted project work out of New London she would slip up the coast to Rockland Maine or to Portsmouth N.H. Her local operations in Long Island Sound even earned her the nickname: "The Galloping Ghost of the Long Island Coast." On occasion though outside of her normal independent routine Witek conducted exercises with carrier task forces for ASW maneuvers. During one such evolution in 1955 Witek exercised with the fleet carrier Leyte (CVS-20) and the atomic submarine Nautilus (SSN-571); other carriers with which Witek operated included Antietam (CVS-36) and Randolph (CVA-15). Besides carrying out operational tests of ASW electronics equipment Witek served as the test-bed for the "pump jet" propulsion system. On 2 July 1958 Witek entered Drydock No. 4 at the Boston Naval Shipyard for an "extensive overhaul and installation of the pump jet system." The destroyer remained in drydock at Boston until a little over a week before Christmas when she emerged with the new system installed. Over the ensuing years Witek tested the system under operational conditions. In 1960 she operated for a time with Task Group "Alfa " the first time in four years since she had operated with the fleet. She conducted extensive ASW operations with that unit until returning to her home port. 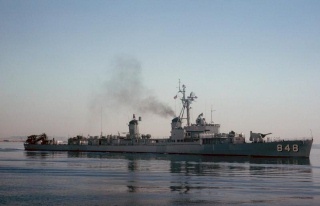 Due to the grounding of Bache (DD-470) in early 1968 Witek was retained in active service. Subsequently decommissioned at Norfolk Va. on 19 August 1968 the ship's name was struck from the Navy list on 17 September 1968. She was then berthed at the Inactive Ship Facility Norfolk to await final disposition.